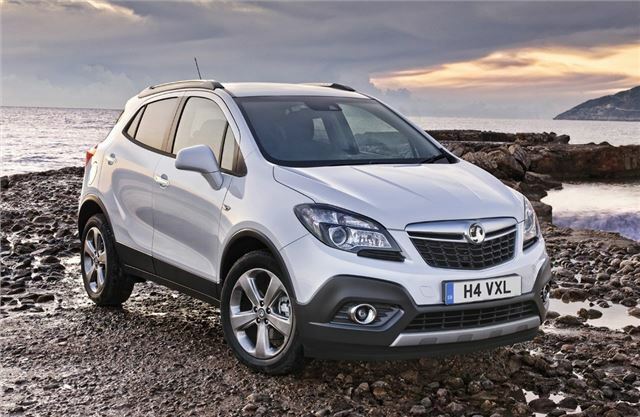 Vauxhall has revealed that its new Mokka will start at £16,995. The compact SUV, which is similar in size to the popular Skoda Yeti, is available to order now with the first cars arriving in November. The entry-level model is powered by a 1.6-litre petrol engine with 115PS and an engine start/stop system. There is also a 1.4 Turbo, the most powerful engine in the range, which has 140PS and gets four-wheel drive as standard. It's not cheap though with prices starting at £20,200 for the Exclusiv trim version. The 1.7 CDTi diesel makes the most sense and is available with either two-wheel or four-wheel drive. The latter averages an impressive 60.1mpg with CO2 emissions of 124g/km. It's also available with a six-speed automatic gearbox, although this does see economy fall to 51.4mpg. There are three trim levels - S, Exclusiv and SE. Standard equipment on all models includes DAB radio, air conditioning, cruise control, a multi-function trip computer and 16-inch alloy wheels. Top SE models get leather seat facings, heated front seats and xenon headlights. Options includes the Vauxhall Front Camera – first seen in the latest Insignia - which gives the driver a Lane Departure Warning system along with Traffic Sign Recognition, Forward Collision Alert plus a rearview parking camera. The Mokka is also available with the useful FlexFix rear bicycle carrier. This is integrated into the rear bumper, and slides out like a drawer, carrying up to three bicycles at a time. Vauxhall is also promising good handling with bespoke damper settings for cars sold in the UK. The steering has also been tuned for British roads with a new Electric Power Steering (EPS) system which is designed to give more speed sensitive assistance.